Kids Konserve introduced me to the 4th and 5th R this week… Reduce, Reuse, Recycle, Recover and REMEMBER! I have about 10 reusable shopping bags because I have forgotten to Remember to put them in the car. It’s so easy to forget to bring a reusable bag, easy to forget your reusable cup, forget to pack your lunch… I can go on because I have a horrible memory. But once you train yourself to do these things and they become habits and the Remembering part becomes second nature- just like reducing, reusing, and recycling. Earth Year 2011 is dedicated to making A Billion Acts of Green happen before 2012. Waste Reduction is a category for green act pledges, and I thought this would be a perfect time to pledge to Remember to pack a greener lunch! 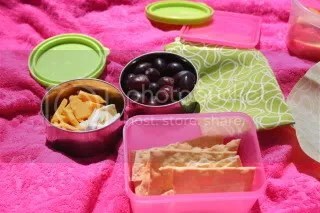 Packing your own lunch to take to work, school, the park, or even when you know you will be out and about, cuts back on literally TONS of waste. 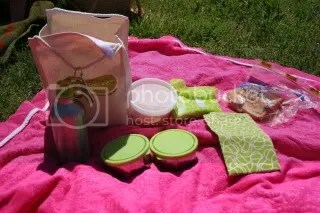 Last week for my birthday we took a picnic lunch to our local botanical garden. I used our Kids Konserve lunch kit, which includes: a lunch bag, 2 stainless steel containers, a water bottle, a food kozy (sandwich wrap), and reusable napkin. Since I packed for 2, I also added a yogurt container and packed another sandwich in a reused bag that came with shredded carrots. I chose all finger foods so no utensils were needed. We stored grapes and local cheeses in the Kids Konserve stainless containers. I packed them the night before, so the stainless steel containers kept the food nice and cold. The stainless water bottle has a clip that attaches to the lunch bag, which is awesome to keep up with! I love the reusable napkin, which matches the kit. The kit is perfect for adults and kids! “How is Kids Konserve different from other waste-free lunch systems? Non-Toxic: Our complete line of reusable waste-free lunch packing products are made from the safest, non-leaching, non-toxic, BPA, PVC, phthalate, and lead-free materials! That is a mouthful, but true! Lead, BPA, PVC, and phthalates are substances that are known to be harmful to our bodies with repeated exposure. Stainless Steel: We offer a wide range of 304 food grade stainless steel solutions as it is proven to be the safest material to house food in. During the month of April, you can get 20% off all Kids Konserve by entering reuse2011 at the checkout!! They also have some amazing deals like $6 stainless bottles! Do you pack your own lunch? What are some of your favorite green lunch foods?